As if you can’t already get enough Skrullerific images from the Who Do You Trust? campaign, Marvel has gone and done it to Marvel’s First Family (with a little help from Mike McKone). 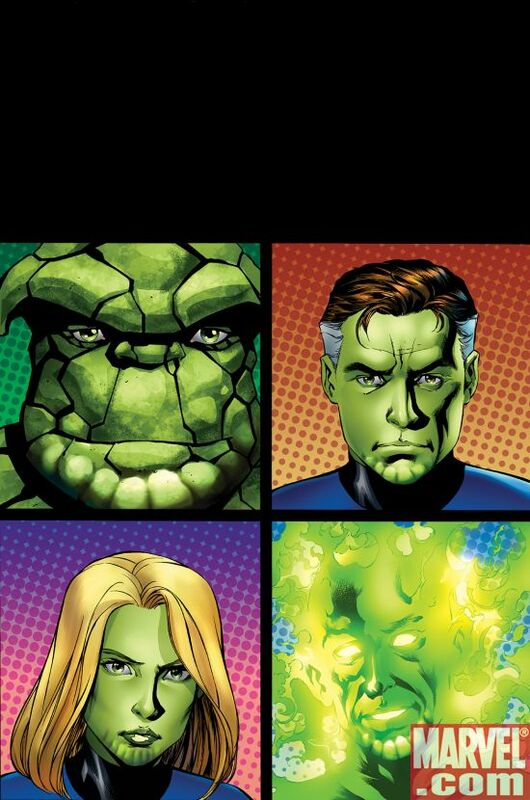 Mavel has sent Major Spoilers the variant cover image to Secret Invasion: Fantastic Four #1 that arrives May 14, 2008. Written by Roberto Aguirre- Sacasa (Marvel Knights 4, Sensational Spider-Man) with art by Barry Kitson (The Order), Secret Invasion: Fantastic Four #1 will have a very Skrully-looking variant cover by Mike McKone, seen here for the first time. Plus, this series promises the return of a very familiar Skrull from the FFâ€™s past whoâ€™s looking to exact revenge on the First Family of Comics. The first issue of this three part series will set you back $2.99. I know I’ve seen that green FIRE somewhere. That green FIRE looks so familiar. Gee, where have I seen that green FIRE?